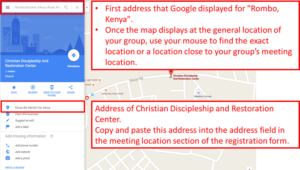 The meeting location address must be set up so that the Children’s Rosary site can determine where your meeting location is on a Google map. This location displays on the View From Heaven map in the site’s home page. Sometimes Google maps has troubles finding your exact geo-location, particularly if your group meets in a rural part of the world. You may need to select a location that is close to but not exactly the point on the map that you meet. In the top field, begin typing your location’s address. As you enter more text of your location, the location should become resolved to the point on a map that Google knows about. If your location does not resolve, then you must find a location on Google Maps that Google does know about. For example: Rombo, Kenya – Google maps does not know of a town called Rombo in Kenya. When you type in Rombo – you get Rombo Tanzania, which is close to Rombo Kenya but is not the correct country. So you need to find a location that Google maps knows about that is close to the location of your meeting. Sometimes Google only knows about a center of a city or town. You do not need to know the exact street address in order to enter an address in the Children’s Rosary form.